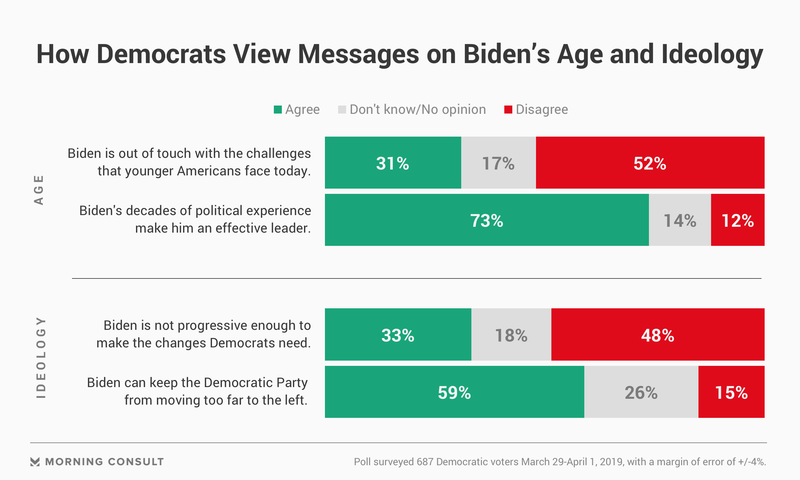 31% of Democrats say Joe Biden is out of touch with the challenges that younger Americans face, while 73% say his decades of political experience make him an effective leader. About six in 10 say Biden can keep the Democratic Party from moving too far to the left; a third agree that he is not progressive enough. As he inches toward a possible third run for president, most Democratic voters view former Vice President Joe Biden’s political experience as a good thing and say he can keep the Democratic Party from moving too far to the left – something he’s cautioned against publicly as other Democrats have pushed more liberal policies. But even before his potential rivals for the Democratic nomination have had the chance to weaponize his age and moderate bent against him, a new Morning Consult/Politico poll finds chunks of the Democratic electorate agree with negative sentiments about the most popular possible 2020 contender. The poll was conducted March 29-April 1, amid an invigorated controversy surrounding Biden’s history of physical contact with women, started by an account by former Nevada assemblywoman Lucy Flores on Friday about an unwanted kiss and touching on the shoulders from the former vice president. It tested both sides of the sentiments about his age and ideology. Nearly three in four Democrats (73 percent) said his decades of political experience make him an effective leader, and about six in 10 Democrats (59 percent) agreed that Biden can keep the Democratic Party from moving too far to the left on the political spectrum. There were little differences between Democratic men and women. Sean McElwee, a progressive Democratic researcher, said the issues he views as most effective against Biden are the “bread and butter economic” ones, such as support for the Dodd-Frank banking regulations and the bankruptcy reform he shepherded in the 2000s, as well as his vote on the war in Iraq. Still, he said the support for Biden among Democrats, so far, is rooted in nostalgia for the Obama administration, in which Biden served for eight years. The latest Morning Consult weekly tracking of a list of candidates and possible 2020 contenders to take on President Donald Trump found Biden maintaining his lead in the Democratic field, with 33 percent of likely Democratic primary voters calling him their first-choice candidate. And in the early primary and caucus states, he leads the primary field with 37 percent of the vote. Nationwide, his net favorability among the group is 67 percent, higher than any other name tested, according to the March 25-29 data based on 12,940 responses. Kyle Kondik, managing editor of Sabato’s Crystal Ball at the University of Virginia Center for Politics, cautioned against overemphasizing views about Biden’s potential liabilities at this stage in the race.